Google released the product first for Microsoft Windows. The beta for Mac was released on 10-Jan-2006. 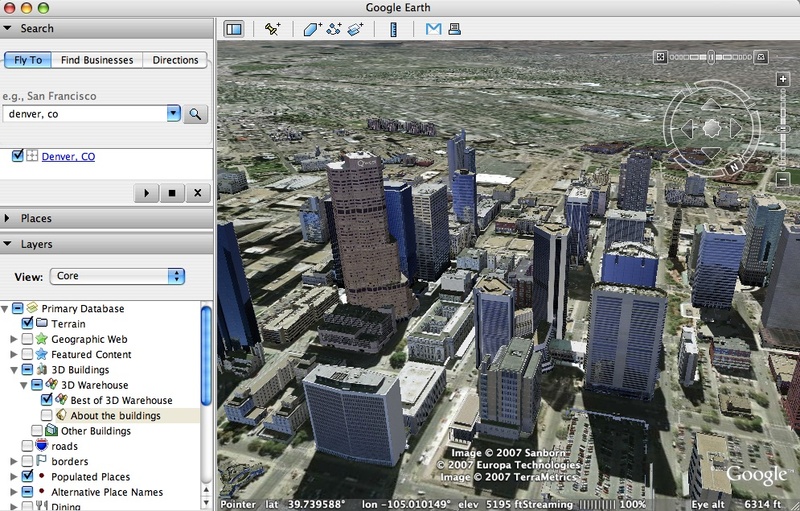 On June 12 of 2006, Google released Google Earth 4 Beta simultaneously for Windows, Mac OSX, and Linux. Google Earth 4 was officially released on January 8, 2007. Download information here. Google Earth was originally based on a product called “Keyhole” which Google acquired when they purchased the company Keyhole in 2004. You need a decent computer with a 3D graphics card, and will find a broadband connection is best. If you have these things, you will find Google Earth one of the most amazing applications you have ever used. To download (and see the required specifications) just go to Google’s home page for Google Earth at earth.google.com and click on “Download Google Earth”. If you meet the requirements they outline there, you’re good to go! Or, just click here: . For information on getting started, go to the Google Earth Basics. This blog is not officially affiliated with Google. Google Earth Blog is dedicated to sharing the best news, interesting sights, technology, and happenings for Google Earth. You will find the most amazing and interesting Google Earth news stories and content you can download right off the site. Learn how to take data from your GPS, map it into Google Earth, and share it with friends or the world. Learn when new releases of Google Earth come out, hear about new technologies and features, or check out the links to dozens of other Google Earth web sites. When Frank Taylor first saw Google Earth he knew it would be a popular phenomena. All sorts of amazing things were going to happen because of Google Earth. And, amazing things have happened, indeed, in the 12+ years since this blog was started. Over 2000 blog posts here are a testament to Google Earth. Frank’s intent was to provide content which will be interesting to both new and experienced users of Google Earth. There may be technical jargon, but we try to keep it understandable to the average user of Google Earth. This blog and its author are not an official source of information on Google or Google Earth. But, we try to get reliable information whenever we can. Frank Taylor is an entrepreneur, a sailor, a pilot, a hiker, and avid technology user. He has extensive experience working with computer graphics and simulation technologies (including work on Space Shuttle and Space Station simulators while working at NASA). He also actively uses GPS technologies (sailing, flying, hiking), and regularly uses 3D graphics applications (such as Google Earth, flight simulators and 3D computer games). Frank also has a degree in Astronomy and Physics from the University of Arizona and is a licensed general aviation pilot. Frank completed a 5.5 year circumnavigation of the Earth by sailboat in 2015 with his wife. Google Earth has revolutionized the ability to visualize geospatial information and has raised awareness about the importance of tying information to location. Frank is constantly reading about new things people are doing with Google Earth, and following closely the developments of new features and plans at Google. This blog was Frank’s attempt to sift and share the best information on Google Earth with the rest of the world. Timothy Whitehead is a programmer living and working in Cape Town, South Africa. He has been a fan of Google Earth since its beginning, and a fan of GEB for most of its existence. Timothy was a writer for Google Earth Blog from August 2014 to July 2017. Mickey has been heavily involved in Google Earth since the day it was released, having launched Google Earth Hacks back in June 2005 and Digital Earth Blog in mid-2007. In addition, he and Frank worked together on a variety of projects. Mickey has a strong interest in Internet technologies and geo-spatial technologies in particular, and is a partner at a web design company in Marietta, GA. Mickey was a writer for Google Earth Blog from 2009 through 2014.